“Nature Self-Portrait #14”, 1996. Gelatin Silver Print, 16 x 20 inches.Courtesy of the artist and the UCLA Chicano Studies Research Center. “My photography has always provided me with an opportunity to open myself up and see the world around me. And most of all, photography makes me look within.” For thousands of years, philosophers used words to explore their internal reality, but for queer Chicana photographer, Laura Aguilar, it was photography that allowed her to delve deep into her soul to create photos as equally pensive as Homer’s The Odyssey. On 25 April, Aguilar died at age 58. As a pioneer of queer Chicana photography, her death comes at a great loss for both photographic and queer Chicana culture who, without Aguilar, would never have been so visually championed into wider queer and American history. Throughout her career, she exhibited in over 50 solo and group exhibitions, and her work has contributed to academia on writing queer Chicana experience permanently into culture. Whether she was shooting Latina lesbians in the 80s, diverse body types in mother nature, or life inside LA’s only queer Chicana bar, Aguilar had a knack for rendering her subjects authentically, while consistently using her art as a form of therapy for coming to terms with her identity. In memory of Laura Aguilar, we trace her incredible and influential legacy. Laura Aguilar was born on October 26, 1959, in San Gabriel, California with auditory dyslexia: a hearing problem where the brain is unable to process sounds in the normal way. Because of the LA public school system, Aguilar remained unaware of her learning difficulties for many years while finding it hard to read and speak. On top of this, her peers found her hard to understand because she couldn’t pronounce certain words. Unsure of what was wrong with her, Aguilar retreated from the outside world in personal solitude as she became more and more insular. Entirely withdrawn from her youth, Aguilar credited her surviving the early stages of her life to her brother, who, after seeing her struggle to express herself through words, lead her to photography. He lent her his camera as a teenager and taught her how to develop film in the darkroom: a moment that would direct the rest of Aguilar’s life. “The best thing in my life is my brother,” Aguilar once stated. “He saved my life.” Until her death, she remained a largely self-taught artist. “12 Lauras”, 1993. Twelve Gelatin Silver Prints, 24 x 17 inches.Courtesy of the artist and the UCLA Chicano Studies Research Center. The photographer’s mixed cultural heritage had a huge impact on her work. Aguilar’s father, Paul Aguilar, was second generation Mexican-American, born in LA to parents who fled the Mexican Revolution, and her mother was half Mexican-American, half Irish. In 1999, the photographer shot “Three Eagles Flying”: a self-portrait which literally placed her passive body, posed like a statue, in the middle of her dual heritage: symbolised in the form of an American flag to the left, and a Mexican flag to the right. The image was a bold metaphor for the eternal struggle of someone trying to fit into two cultural identities, as Aguilar literally suffocates herself with the Mexican flag bagged to her head, and uses rope to tightly bind an American flag to the lower half of her body. The image is said to address Aguilar’s feelings of displacement: it is visual hyperbole relating to how visually disconnected she felt from her family growing up. Because she did not have her mother’s features, people hardly ever connected her with her mum. “...I used to tell people I grew up on the edge of nothingness,” she once told her close friend, writer Sybil Venegas. Going deeper than visuality, the work addresses Aguilar’s childhood inability to verbally express her cultural identity (due to her dyslexia), as well as the loss of her grandmother, her skin colour, body weight, limited English speaking abilities, and her inability to speak Spanish. Intensely personal, the work speaks painfully to anyone who understands the battle of trying to satisfy the multi-faceted sides of themselves. “Three Eagles Flying”, 1990. Three Gelatin Silver Prints, 24 x 20 inches each.Courtesy of the artist and the UCLA Chicano Studies Research Center. 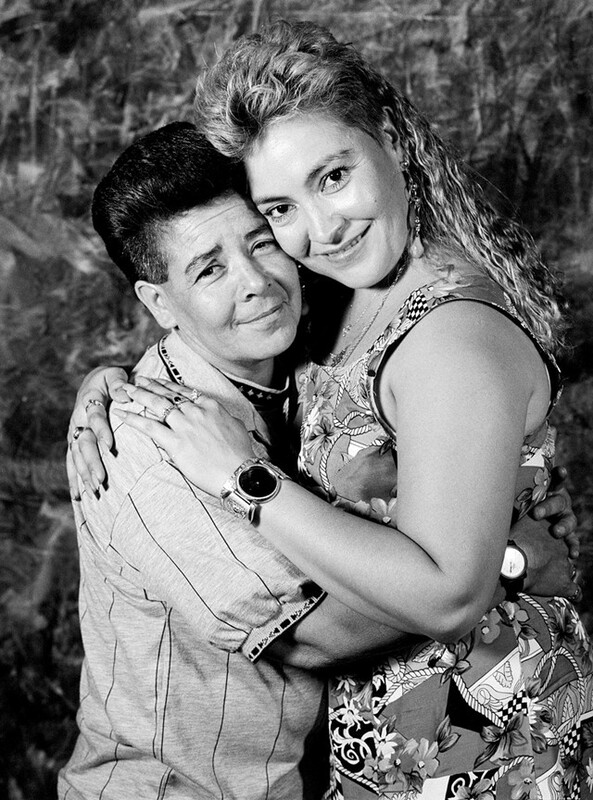 In 1987, Aguilar shot her Latina Lesbian series: a collection of black and white portraits of queer Chicana musicians, lawyers, and mothers. The series picks up on the style Jim Goldberg’s 1979 Rich and Poor series, by including handwritten monologues under each subject. In this sense, Aguilar allows her subjects total control over the telling of their own identity, stripping power from the photographer, and placing it into the hands of the subject. Locking a direct gaze with the camera, all of Aguilar’s Latina Lesbians appear proud, and liberated in their identities. The series also features a self-portrait, which Aguilar uses as a form of coming out. While she did not directly connect with the word lesbian, her inclusion in the series was an act of self-identification and realisation for the photographer. In the image, “Laura” (1988), Aguilar stands among personal possessions, and the image is bordered by a set of cartoon tarot cards: a coming together of Laura’s spiritual evolution. Under the image Aguilar’s handwritten scrawl writes “I am not comfortable with the word lesbian, but everyday I am more and more comfortable with the word LAURA”: a deeply personal reflection on the photographer's coming of age. “Don't Tell Her Art Can't Hurt (Part A)”, 1993. Gelatin Silver Print, 57 x 40 inches.Courtesy of the artist and the UCLA Chicano Studies Research Center. “Plush Pony #15”, 1992. Gelatin Silver Print, 11 x 14 inches.Courtesy of the artist and the UCLA Chicano Studies Research Center. In the late 90s, early 2000s, Aguilar shifted her photography to land art in a deep exploration of her body, and the infinite connection between the female form and the landscape. Picking up much of Cuban artist Ana Mendieta's artistic sentiments, “Stillness” (1999), “Motion” (1999), and “Center” (2001) fuse female bodies with different landscapes. With seamlessness, Aguilar's naked body becomes one with the land. In “Motion”, the artist sits on the ground, bent over in the form of a rock as the folds of her skin mimic the edges of the undefined boulders that surround her. Executed in black and white, at first glance it seems impossible to differentiate which form is human and which is not. Critics said Aguilar's turn to land art was to extract her form – commonly rejected from society for not fitting within socially constructed ideals of beauty – from humanity, to take it back to the natural world as a space free of judgement. In these works, Aguilar also takes her form away from male-dominated sexualisation and perception and returns it to the purity of mother nature. “Motion #56”, 1999. 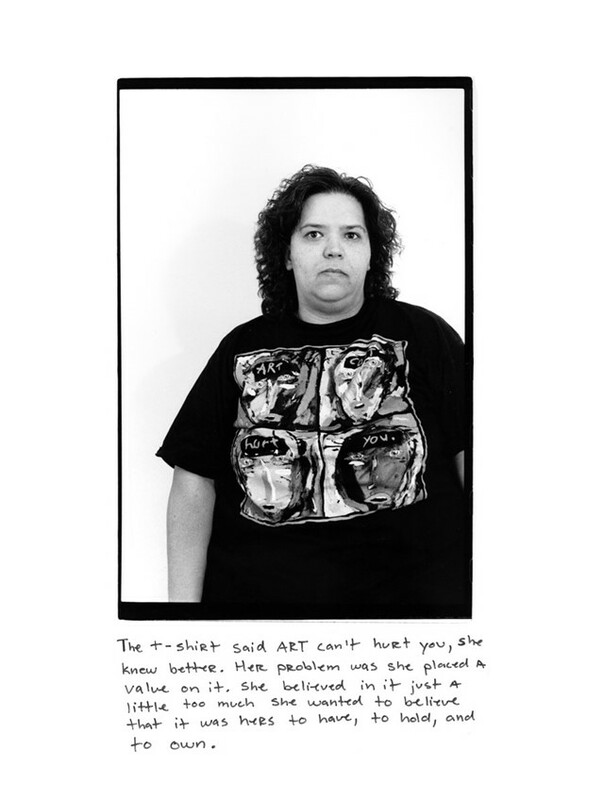 Gelatin Silver Print, 20 x 16 inches.Courtesy of the artist and the UCLA Chicano Studies Research Center. “Clothed/Unclothed #14”, 1991. Two Gelatin Silver Prints, 20 x 16 inches each.Courtesy of the artist and the UCLA Chicano Studies Research Center.